January 22, 1956. It is 4:30 AM as the crew of extra 4343 west gather at the yard office to get their initial train orders that will allow them to depart Taylor yard in Los Angeles and head railroad west towards their destination, Bakersfield California. On the Verdugo Valley Lines, even though the railroad runs compass north and south it angles geographically east and west, which corporate headquarters decided to use to indicate train direction. The engineer today is Tim Johnson, a 10 year veteran on the railroad, Chris Keller is the fireman, 5 years on the job and almost ready for promotion to the right hand side of the cab. Riding in the caboose is Mike Allee, the train’s conductor and finally the brakeman, Alex Novati. All of the crew are very experienced at train operations over the line and today, like any other day, this experience will be needed to get their train safely to Bakersfield. Taylor Yard, located at the edge of Los Angeles is a very busy place on the Verdugo Valley Lines. Here freight trains arrive and depart 24 hours a day, 7 days a week. The incoming trains roll past an icing platform, which is used to put large blocks of ice into refrigerator cars that are going to be taking citrus and other perishable food products to the markets on the East Coast. The trains then continue onto the “balloon” track behind the roundhouse, are routed to the selected storage track and parked. Once a train has been turned over to the yard crew, the locomotive is pulled off, serviced and then given a full load of water, fuel and sand in preparation for the next trip. The cars are sorted, either continuing on to other destinations or going out on local trains to be spotted at the various industries along the line. Taylor Yard has the means to service and repair the steam locomotives, large and small, that still run here as well as the newer diesel electric locomotives that are starting to show up. Inbound and outbound freight trains pass a diverging track used by passenger trains that will stop at Glendale station and then the passenger terminus at Los Angeles Union Passenger Terminal when inbound and in reverse order on the way to Bakersfield. It is now 5:00 AM, the crew of extra 4343 west has climbed aboard, done all checks including the air test and is ready to go. Two long whistle blasts from the big 4-8-2 Mountain type steam locomotive tells everyone within earshot that a train is getting ready to move. Tim adjusts the forward/reverse lever, known to railroaders as the “Johnson Bar” and carefully tugs on the throttle lever. As soon as he hears the sound of steam emit from the cylinders at the front of the locomotive he slowly pulls the throttle out some more. Very slowly the locomotive starts to move and as it does so Tim continues to pull the throttle towards him. At the same time fireman Chris Keller is adjusting the amount of oil being let into the firebox as well as adjusting the various valves that keep the right amount of fuel, water and steam pressure going to the locomotive. As soon as the train is at the proper yard speed Tim stops moving the throttle and settles back to watch the signal aspects. “Green over red” Tim calls out to Chris, “Green over red” Chris shouts back. This is the typical cab conversation in a steam locomotive; the cab is so noisy that the only communication is to verify signal aspects in order to practice safe operating procedure. At the yard limit extra 4343 west picks up speed as it passes through Burbank. It is still early and most people are sleeping, but the picnic tables in Memorial Park are clean and ready for visitors, the shops along Magnolia Blvd. are waiting for opening time as well and the Cornell Theater will begin showing the feature film promptly at noon as usual. The railroad is on a slight grade leaving Burbank so 4343 is really working as it comes around a right hand curve into the sleepy town of San Fernando. There is a passenger station here with a freight house attached, so there is a spur track that normally has one or two cars spotted for loading or unloading. Since 4343 west is a freight train and the signal is green, San Fernando is a passing vision to the crew as the train enters the Newhall tunnel and heads down the stretch of track that leads to the next destination, Saugus. There isn’t much of a grade between San Fernando and Saugus so Tim doesn’t have a lot to do besides watching the track ahead. Chris, on the other hand has his eye on the sight glass showing the amount of water being injected into the boiler. He knows that if the water level gets too low it could put himself and Tim as well as the locomotive and train in danger from a boiler explosion. But since Chris is an experienced professional no harm will come to anyone as the train rolls into Saugus. Fast forward to May 10th. 1969. As the 100th. anniversary of the driving of the Golden Spike, which heralded the completion of the first transcontinental railroad, is being celebrated in Promontory, Utah, extra 6442 west is in the siding at Saugus, California waiting for a meet with the Los Angeles bound Super Chief. Tim Johnson is once again the engineer and Rob Thatcher the fireman for this trip. Much has changed over the years and sitting in the cab of the EMD F7A Tim marvels at how different these diesels are from the steam locomotives he used to run so many years ago. In many ways the job is now much easier; the cab is more comfortable and quieter. Plus the diesel electric locomotives can go for a long time without needing anything more than refueling. Rob’s job is more or less a training position to engineer, his main duty is to watch the track ahead and call out signal aspects. Tim will give Rob time at the throttle as well so that by the time Rob puts in for the promotion he will already have some of the experience necessary. Saugus is an active spot on the railroad, next to the passenger station there is a team track that sees many car loadings each week. In addition there is a spur track off of the siding that serves two fairly large businesses. Switching activity can congest the railroad and the dispatcher has his hands full when the locals work here. Another major customer is the orange grove, which yields enough fruit to warrant the icing platform in Taylor yard. Before too long the headlight of the Super Chief becomes visible just before it exits the tunnel a ways beyond the west switch and the PA announcement from the station agent verifies the train’s arrival. The sleek red and silver “F” units of the Super Chief are a bit cleaner than their counterparts waiting on the siding but that is no surprise since the incoming passenger train is still THE premier way to get from Chicago to Los Angeles. After letting off passengers and taking some on board, the Super Chief sounds two blasts from its air horns and accelerates out of Saugus, bound for its destination at Los Angeles Union Passenger Terminal. The dispatcher lines the switch in order to let extra 6442 west out of the siding. As soon as Tim sees the green signal he moves the throttle to run setting 1 and releases the train’s brakes. Looking down out of the cab window Tim watches the ground until he sees the train start to move, waits until he knows that the slack between the couplers has been pulled tight then starts moving the throttle, one run setting at a time, until he is at run setting 8, full throttle. The sound of the diesel locomotives that are connected together in MU (multiple unit) reverberate off of the tunnel walls and since there is a definite grade on this section of track the horse power of all 3 locomotives will be needed in order to keep the train moving. The track is fairly straight through this area but before too long the train enters a left hand curve and comes into the Antelope Valley town of Lancaster. Fast forward to July 15, 1976. America is celebrating its bi-centennial as a nation and to honor this event most railroads, large and small, have painted at least one locomotive in a special commerative scheme. Cotton Belt SD45T-2 number 9389 is a fine example of this patriotic endeavor and today she is on the point of a freight train in the siding at Lancaster waiting for a meet with a Los Angeles bound train. Once again Tim Johnson is the engineer, but this is a special day for him. After 40 years on the railroad it is his last run and after arriving at Bakersfield he will be renting a car for the drive home to Glendale and a fine retirement plan. Today’s fireman is Ed Sikora and the crew in the caboose consists of Larry Kedes who is the conductor and Vince Stuck who is the train’s brakeman. There is a passenger station in Lancaster but since 1971 the passenger trains that stop here belong to a national passenger rail service called Amtrak instead of the individual railroads themselves. Although the colorful Santa Fe and Southern Pacific passenger trains are gone now, Amtrak has preserved the ability to travel by train, which had been in danger of disappearing with the advent of the jet age. There is a small railroad yard here in Lancaster and tucked into a corner next to it is a stock yard that stills sees seasonal activity and even with the increased use of semi-trucks to get cattle to market there are still some railroad owned cattle cars spotted here for loading. The rail yard isn’t used as much as it had been, but the railroad is leaving the tracks in place for bad order setouts, etc. As Tim looks out for the headlight of the opposing train he thinks about the career he has had and how different things have become over the many years of service. First the noisy, hot but personable steam locomotives were replaced by the more efficient, reliable diesels and now as he sits in the cab of 9389 he is enjoying a cool 72 degree temperature inside knowing full well that outside it is just a bit over 100 in the shade. All thanks to a little something called air conditioning that was included on this order of SD45T-2 “tunnel motors”. Soon the headlight of the other train becomes visible as its lead locomotive hits the straight track inside the tunnel that is just beyond the west switch at Lancaster and then the distant rumbling becomes a full roar as the locomotives come out into daylight. Just before the opposing train gets to the switch Ed climbs out into the desert heat to inspect for any possible defects on the train that will be passing them, such as dragging brake shoes or loose rigging hanging down from the cars. After the caboose on the rear end of the other train passes by Ed climbs back into the cab of 9389, wipes the sweat off of his brow and reaches into the small cab refrigerator for a bottle of water. Tim looks over, smiles and asks “Is it hot enough for you?” Ed frowns and replies “Only if you like being inside an oven.” Ed then asks “Are you sure you’re ready to retire and give all of this up?” He grins as he motions with his hand to the desert scene outside. “Oh yeah” Tim replies, “I already have my house in Glendale up for sale and the wife is ready just like me to spend our golden years in that place we just bought outside Tehachapi”. “OK”, replies Ed, “just wanted to double check”. Tim, who has been anticipating the switch to be thrown and the signal controlling his train to turn green, gets ready to start the train and when he sees the all clear he sets the throttle to run 1 and releases the brakes. Shortly the train begins to move and knowing that a stiff grade is waiting just inside the tunnel they are headed for Tim moves quickly through the throttle settings until he gets to run number 8, which is full throttle. Tim checks the amp meter and notes that even at full throttle the needle is still well away from the danger zone so he relaxes and lets the 3600 horsepower 9389 and accompanying 3600 horsepower locomotives do their work. The grade is pretty constant on this part of the railroad so Tim leaves the throttle wide open and watches for the end of tunnel, which leads to the town of Mojave. Fast forward to December 3rd. 1989. The westbound Amtrak passenger train pulls into the town of Mojave to let off and take on passengers. Scott Mckeown is the engineer today and Eric Friday the fireman. The onboard train crew consists of conductor Don Bergman and assistant conductors Larry Stark, Tom Graham and Dave Rickey. Mojave has a fairly large yard that is very active. Each day local trains leave here to pick up and drop off cars at the various sidings and spur tracks all along the railroad. In addition Mojave is the point at which the railroads one and only branch line heads off to Owenyo and the transfer point with the narrow gauge line that goes up to Laws, California. There is an engine service area in Mojave as well so that the locomotives used on the local trains can be fueled and traction sand hoppers topped off. There is also a small engine house here that allows minor repairs to be done. The station in Mojave is very old, but well taken care of and the town soon hopes to have it listed as a historical landmark. On this overcast, chilly December day there are several passengers getting off and about 25 getting on. The onboard crew is very efficient and before long conductor Bergman is calling on the radio to the headend crew letting them know that all of the passenger car doors are closed and the train is ready to go. Since Scott already has a green signal he sets the throttle to run setting one and releases the brakes. The train is powered by two EMD F40PH locomotives, which will provide plenty of muscle and this will be very important since the tracks just beyond the west switch not only head into a decent grade but a right hand curve as well, which combined will require all the power the locomotives can supply in order to keep moving. As the train heads into to the curve and up the grade Scott gradually moves the throttle up to run setting 8, checks the amp meter, sees that the needle is a bit closer to the overload section than yesterday and makes a mental note to keep track of the meter until the train reaches level track as they approach the cement plant at Monolith. As the train continues to climb the grade Scott checks the amp meter again and backs off the throttle to run setting 7 in order to keep the needle of the meter out of the overload section. This causes the train to slow down just a little bit but not enough to be in danger of stalling. Coming out of the curve the train finally gets onto level track and Scott is able to relax; he knows that if the amp meter gets into the overload section and stays there too long the traction motors on the locomotives can be severely damaged. Now on straight level track the Amtrak train passes by the cement plant at Mojave, which was built in the early 1900’s in order to produce the massive amount of concrete needed to build the Los Angeles aqua duct, which brought water from the Owens Valley to the rapidly growing city of Los Angeles. After going past Monolith the train will be heading into the world famous Tehachapi Loop. Fast forward to August 31, 2011. Today steam has returned to the Verdugo Valley Lines in the form of ex Santa Fe 2-8-2 Mikado type steam locomotive number 4043. Owned by the Southern California Steam Preservation Society this locomotive makes occasional outings on the Verdugo Valley Lines, much to the delight of rail fans lucky enough to get a ticket for the train ride or secure a track side spot for taking pictures. Joe Wilke is the engineer and has been with the society for many years. He knows everything there is about 4043 and can sense from each sound and vibration when the throttle or “Johnson Bar” needs to be adjusted to match the grade and track condition. Equally as capable is fireman, Matt Marchioli, who has also been with the society for quite some time. Working as a team Joe and Matt concentrate on making sure that 4043 is handled safely and properly, they are very well aware of the historic treasure that they are in charge of. On board the train there are many volunteers from the society acting as car hosts and they are supervised by the society’s conductor Paul Koehler. The Verdugo Valley Lines requires its own pilot engineer to ride along whenever 4043 goes out on the main line and today that job has been given the Road Foreman of Engines, Scott Sackett. Another stipulation by the Verdugo Valley Lines is that when the 4043 is run it needs to be accompanied by a diesel, not only to be able to power the train if the steam locomotive becomes disabled but to make the run safer by using the diesels dynamic braking to assist in keeping a safe speed when going downhill. Rather than use one of the Union Pacific locomotives that perform normal operations on the railroad the society purchased an ex Santa Fe GP35 and have refurbished it to like new condition. The engineer in the GP35 today is Keith Cole and to keep him company is fireman Glenn Aames. 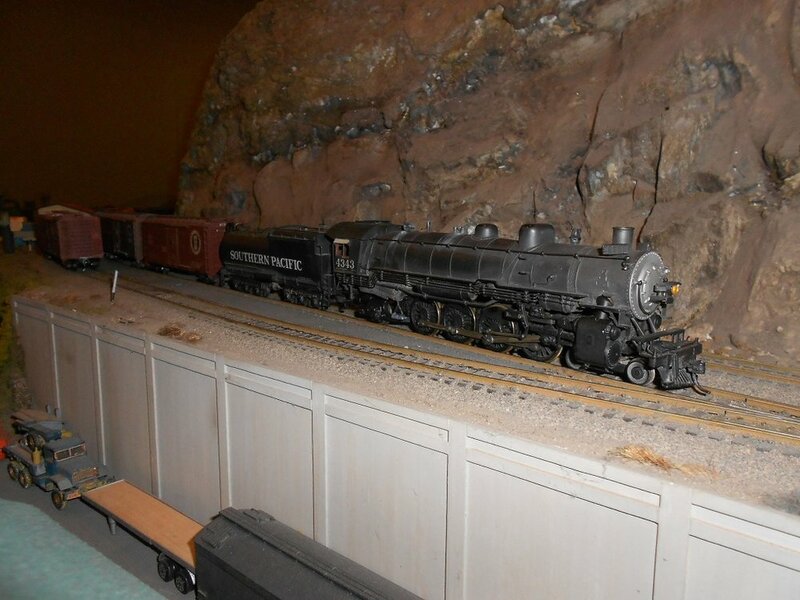 After making the run from Los Angles, through San Fernando, Saugus, Lancaster and Mojave the special train is about to navigate one of the most well-known railroading landmarks in the world, the Tehachapi Loop. When the railroad was building from Bakersfield towards the then small, but important town of Los Angeles in the late 1860’s the track building crews soon found their first major obstacle as they were coming out of a valley just beyond Bakersfield. They found that the railroad needed to climb a grade that the planning engineers knew would be impossible for any locomotive to negotiate. As the men in charge were pondering what to do one of the engineers noticed a hill that had a donkey trail going up and around it. Upon closer inspection the engineer realized that this same donkey trail could be utilized to get the tracks up the grade in such a way that locomotives of the time would be able to climb easily. As soon as the idea was proposed it was agreed to be the solution and the Tehachapi Loop was born. Since then the motive power that went across the loop changed in dramatic ways over the years. The steam locomotives kept getting larger and larger in order to pull the increasingly heavy trains up over the grade and then of course the wide variety of diesel locomotives that have come and gone. With the return of 4043 to these rails nostalgia is the order of the day and all who see her, both young and old, won’t soon forget the experience. As the train starts heading down into the loop Joe uses the two-way radio, added by the society, to talk to Keith in the diesel in order to coordinate the use of dynamic braking and soon the rumble of the GP35 turns into a distinct whine as Keith runs up the dynamic brake control. Much too quickly the loop becomes a memory, but thanks to all of the cameras around a well recorded memory, and the special train heads towards the small town of Caliente. Once a railroad town, the only thing left is a small station and spur track that sees a few car loadings each month. As Caliente is left behind the train goes past the even smaller town of Edison, where Mayor Mike O’Brien steps out of his office to wave at the passengers. The train now heads into the final stretch of track and approaches the railroad yard at Bakersfield. After being cleared in, the train parks on a track close to the main access road where busses are waiting to take the passengers to a local hotel for a banquet and overnight stay. Early tomorrow morning they will be brought back to the train for the return trip to Los Angeles. We hope you have enjoyed this tour of the Verdugo Valley Lines, please come to see us, we are open to the public on the first Monday of each month from 7:30 to 10:00 pm and twice a year we open our doors for a Saturday and Sunday open house as well (see our schedule for details).